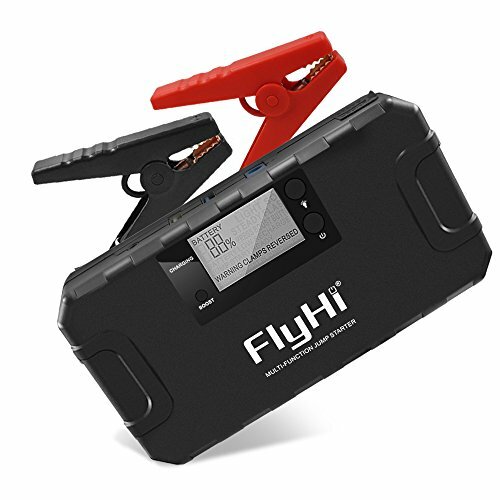 【 MULTI-PURPOSE】 FH-42 digital jump starter come with 5 built-in functions: 1. Jump starter 12V cars, 2. Dual USB outputs, 3. 12V/10A output for car appliances, 4. LED flashlight, 5. S.O.S lighting signal for emergency. 【 SMART PORTABLE CHARGER】 FH-42 jump starter come with dual USB outputs (including a fast USB port with 5V/9V 2.4A output) and a DC 12V/10A output ( Included a female cigarette lighter socket). If you have any questions about this product by FlyHi, contact us by completing and submitting the form below. If you are looking for a specif part number, please include it with your message.